Do you ever have days where you a) didn’t want to cook; b) didn’t plan dinner; and, c) didn’t want to cook…? I do that all the time so I got creative with some left overs. I had pulled pork that was in the fridge left over from making these yummy quesadillas and I made Pork & Black Bean Rice Cakes with a Cilantro Sour Cream Sauce. “Rice cakes” sounds pretty scary, right? Visions of beige disks that taste like cardboard…? Not at all. 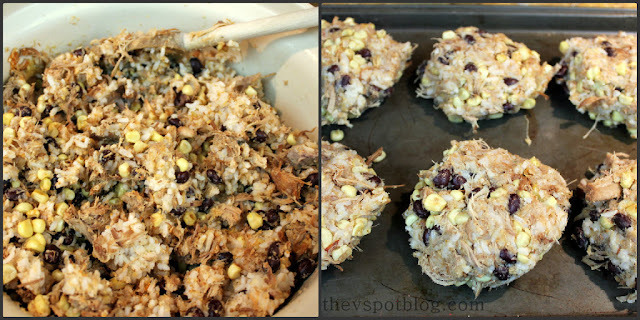 These were savory and good, full of spicy pulled pork, black beans and roasted corn, topped with a creamy, tangy sauce. Enjoy! Start by cutting the corn off of the cob and letting it caramelize on a hot griddle. Melt a little butter on the griddle, add in a little salt, pour the kernels on, mix to coat with the butter (add more salt if you’re a salt person) and let it sit, stirring only occasionally. When the kernels have a beautiful golden brown color starting to show, turn off the heat and let them cool. Mix all of the ingredients except the sour cream, cilantro and red wine vinegar into a large bowl. Scoop a ball of the mixture into your hands and form a flat patty. 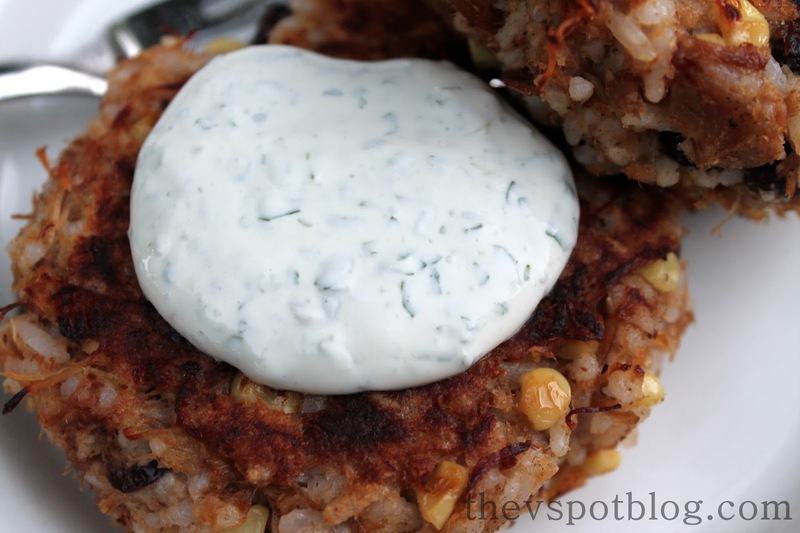 (The next time I make these, I will add a smidge more of the Sriracha sauce and make the patties flatter.) Over medium heat, add a little vegetable oil to a skillet and gently place the patties in the hot oil. Let them cook on each side for about 3 to 4 minutes, until they are a nice golden brown. 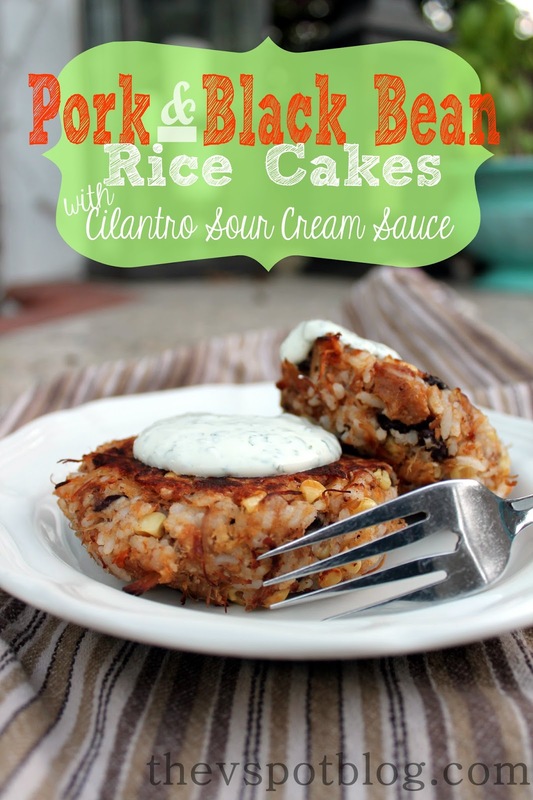 While the rice cakes are cooking, make the Cilantro Sour Cream Sauce. 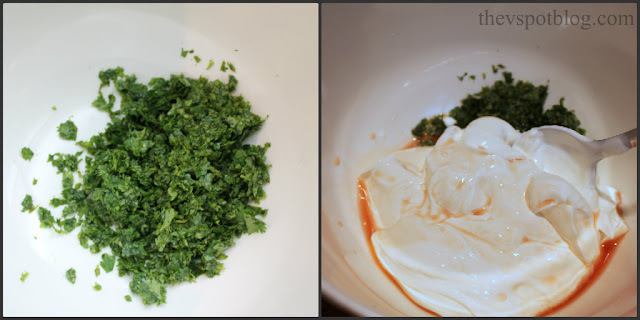 Finely chop your cilantro (or use a food processor) then mix with the sour cream and vinegar. When your rice cakes are done, drain on paper towels and keep warm in a 200 degree oven until ready to serve. Top with the Cilantro Sour Cream Sauce. I think you could probably do a variation of this with lots of different things. Experimenting is fun and is a great way to get rid of leftovers in a way your family will enjoy. All I can say is DEE-LISH!